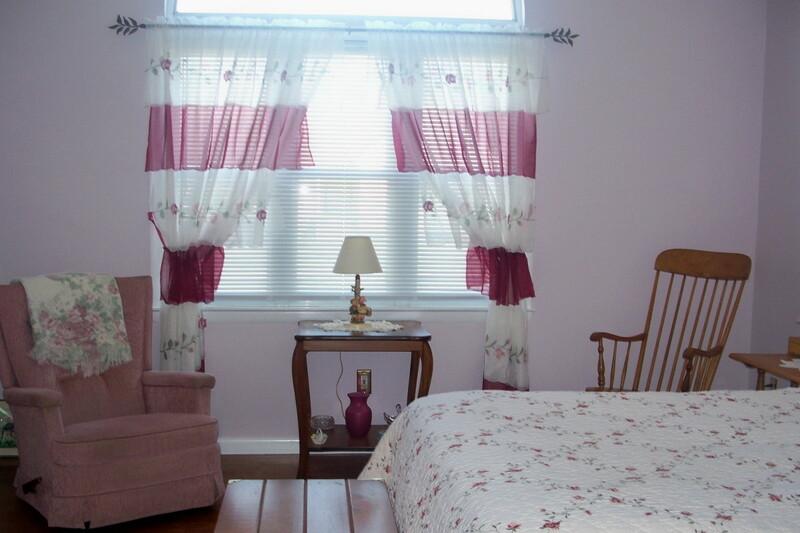 You want money saving tips for redecorating your bedroom. Than give these tips a try. They are easy and you will be trilled with the results. Are you tired of yard work or you are at that point in your life that you can not do it anymore? 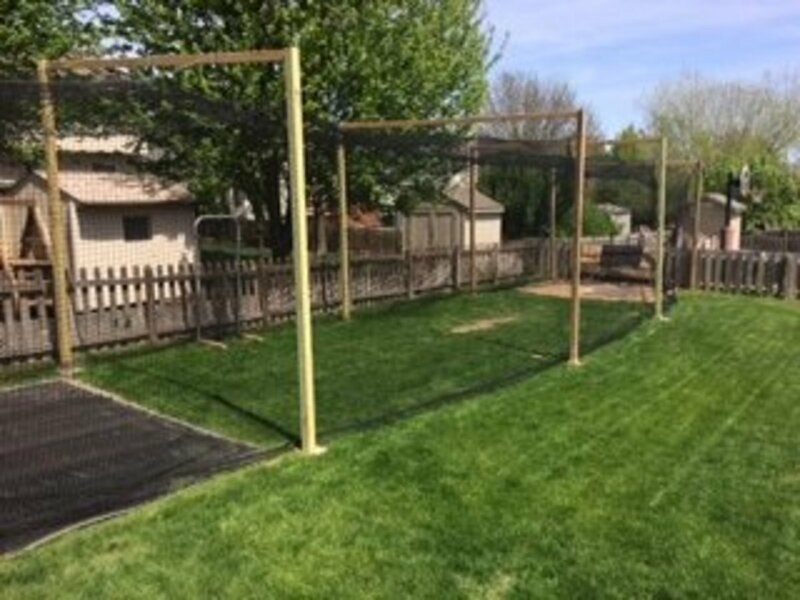 This is a do-it-yourself-project that will give you a low maintenance backyard. 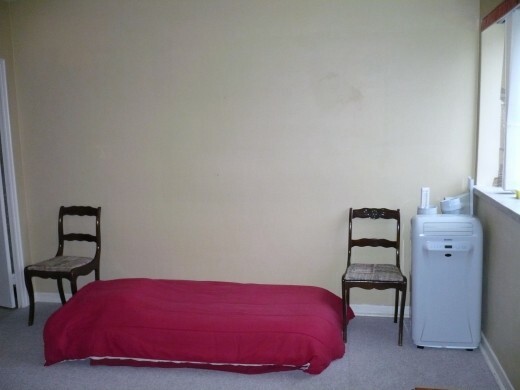 Due to hard economic times try rearranging the furniture you own for your decorating needs. I will be showing you step by step how to decorate a bedroom on a budget. By using garage sale treasures, thrift shops finds, and stuff your neighbors throw away, you can't afford not to make a decorating change to your bedroom. This is my spare overnight guest bedroom. My guests told me we are getting older and it is harder to get off the floor. Do you have this problem at your house? I decided to accommodate my guests better. Since my balcony on the third floor of an apartment overlooks a river, with a boat house that rents boats, I thought a theme in blue would suit my guests. I did my homework and found blue is a very calming color so decided to paint the wall in the picture behind the red mattress country blue. The painting trick here is to only paint one wall blue ( a lot cheaper than painting the whole room and less time too)and use blue accessories around the room ,lots of them and it will trick the eye into perceiving the guest room is blue. 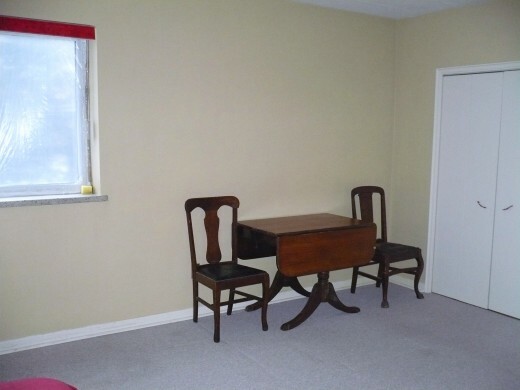 I exchanged the dining table and chairs for a laptop computer desk with matching CNR (Canadian National Railway) chair my neighbor donated to the cause. The window my sister donated from her barn and the lamp was a three dollar thrift store find. To make The chair and desk match, I painted them all white, then painted them all cobalt blue after the white paint dried. Then, in a couple of days when the paint is really cured rock hard ,you start sanding the blue off,allowing the white to peek through. This painting method is called pickling. It is a lot of work, but ,I love the effect it has on old flawed furniture. 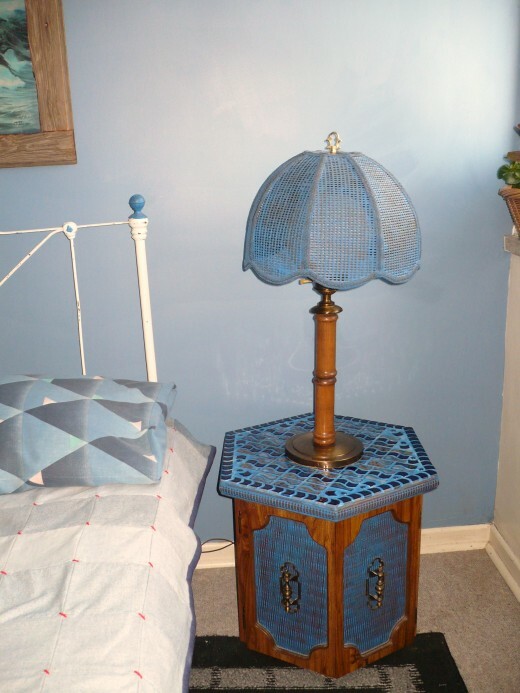 To match the lampshade which was black; I also painted it blue. Yes, I am painting crazy... if you stand still long enough, I will paint you too. The glass beads for the window were a dollar a bag at the dollar store. You glue them on with any glue that bonds glass and will dry clear. The material I found for the bedroom window was actual panels of existing drapes(in blue and gray sort of burlap texture material) at the church sale across the street from my apartment. The whole garbage bag full about six large panels was five dollars. I brought them home,washed them and cut them into seven strips of material(12 inches x 39 inches long). The two hanging panels are ( two inches bigger all the way around, than the exact size of your window cut in half). Then you hem the nine sections of material all the way around so they don't fray when you wash them again. It is very important to fold the top of each large panel down an inch and sew so you can thread the curtain rod through. The seven other panels,you fold each end (of the panel)over an inch and sew for the curtain will be looped and each end will attach to the rod (see picture). The tassels are a nice touch and are about three dollars at any fabric store. 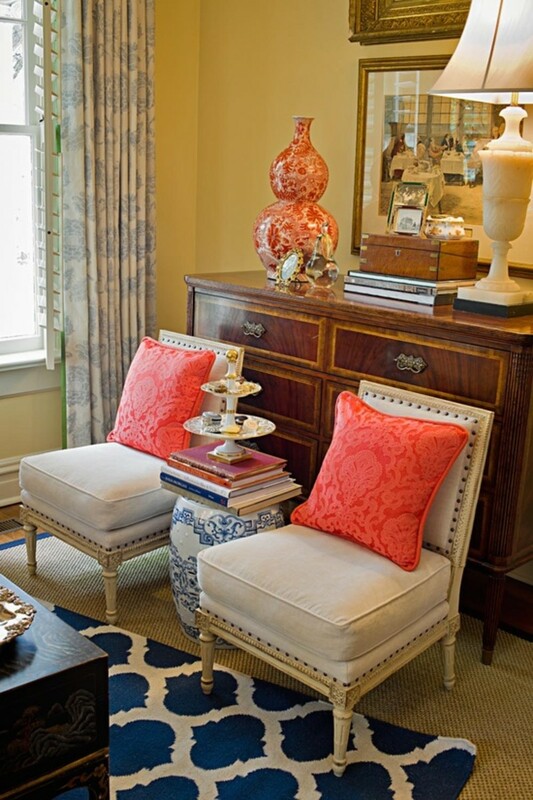 I choose to run the valance from the left corner above the window to the right corner of the room, above the desk. This looks great and tricks the eye into thinking the room is bigger than it really is and adds a lot more color to the room. The birds are an outlined of a Cardinal and Blue Jay drawn on the flat top of a two x four. Then, you cut them out with a jig-saw and sand the edges until rounded. You drill a hole the same size as the wooden dowel, in the birds and also into another piece of 2x4(about 2 inches wide) for the bottom support. Take the dowel and glue to the holes in the birds and glue to the two inch wide 2x4 bottom..A simple project that gives the window a focal point. If this seems too hard to do ,a nice piece of your favorite driftwood will have the same effect. The bed will be the focal point of your whole room. The bed, I picked was a thirty five dollar iron double bed, that was at a yard sale. If I didn't buy it, the owner was going to make a flower bed out of it. 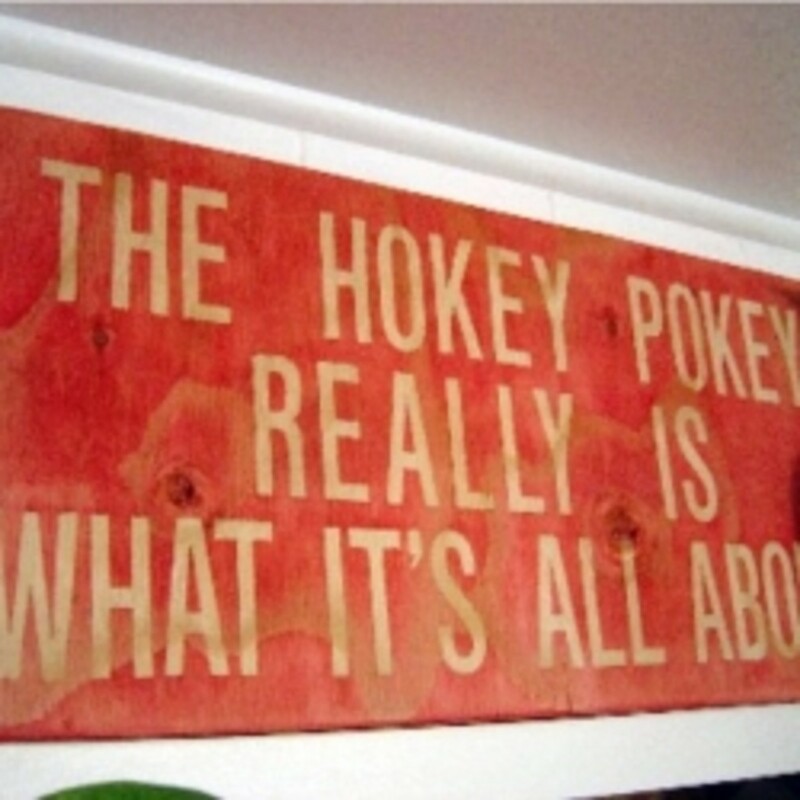 I brought it home and painted it white with the circles of nuts and four corner knobs I painted blue. I purchased a new mattress for it. The bed cover, I made from squares of four inch square blue jean patches, from blue jeans, I bought at yard sales and thrift shops. After I had the patched blanket big enough to cover the bed, I sewed on a royal blue sheet for the back, which folds over to the front of the blue jean cover,to make a neat finish. The pillow cases I had. The picture over the bed is a poster of an ocean scene that I framed with barn boards. The left side bed stand, is a two shelve stand , I painted black that I rescued from my neighbors garbage with a tiled cheese board on top. The right bed side table ,my friend Sue wanted to get rid of ,so I adopted it. 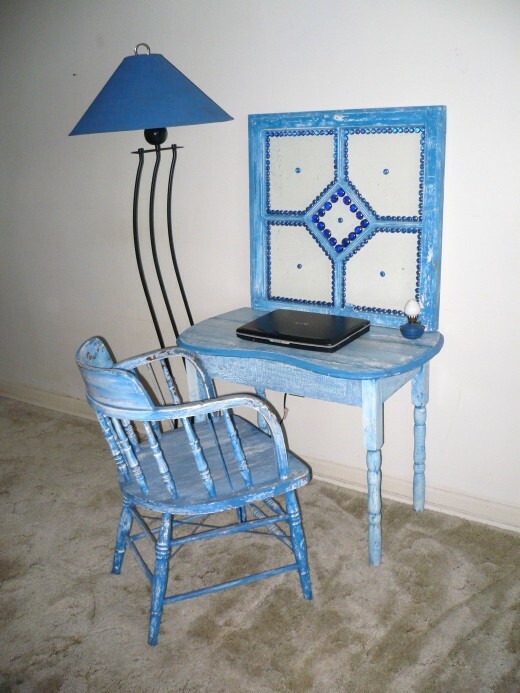 I tiled the top of this table with tile left over from another friends swimming pool and painted the front doors blue. The lamp shade for the lamp I also painted blue that sits on the table. I like to put the black and gray 5 foot x9 foot carpet under the bed so each side of it gives you a cozy landing, when you get out of bed. This is safer than having separate carpets on each side of the bed. This was a five dollar yard sale find. The trunk at the end of the bed I had ,it will provide storage for this room and also hid my guest's suitcases under the bed. This whole project was under two hundred dollars plus the cost of a mattress . You need to put some elbow grease and some of your time into it. Remember, it doesn't have to be done in one day. Take your time and enjoy doing it. This bedroom has heating coils in the ceiling to heat this room. This heating system is very expensive and the comfort level is very low because the heat stays at the ceiling. Suzzycue uses an oil heater to heat this bedroom. This Garrison oil heater paid for itself from the savings of not using the ceiling heat. An older friend who loves to sit on her upper deck and tend to her flowers needed shade from the sun because of skin cancer. I built her a low maintenance backyard to help save her money in her home. 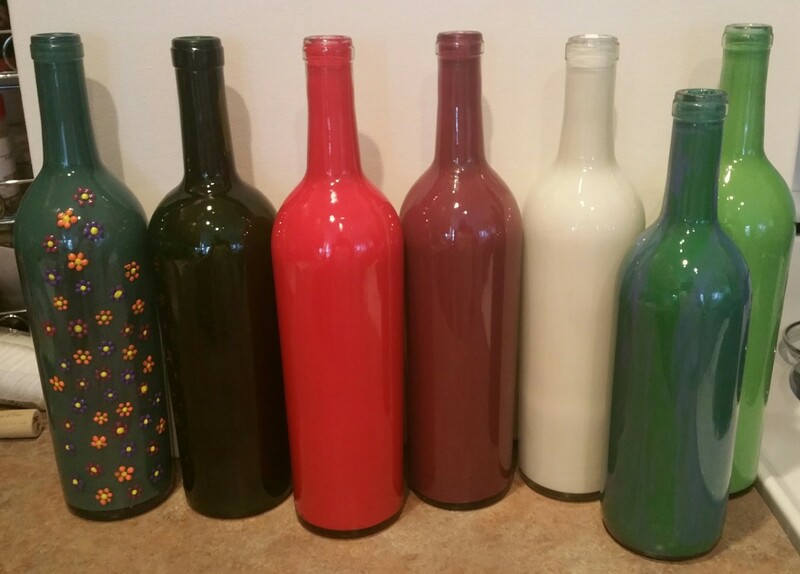 Save Money in your home by making garden art from things you already own. How to make your own out door décor. A how to make garden art video. Do you live in an apartment where you are not allowed to paint the walls. This DIY bathroom makeover is done without painting. You can remove it all when you move, to decorate your next home. 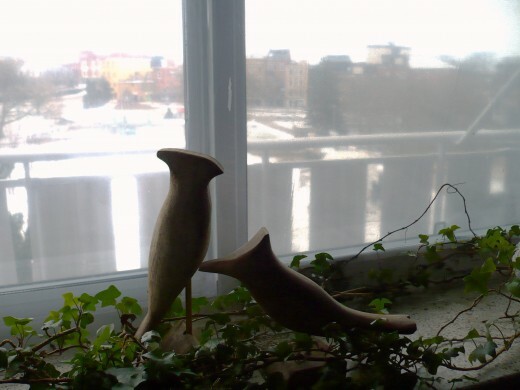 @Jen Thank you :) That window I now use on the divider wall of my balcony. It is one of my favorite projects from found objects. I really liked the barn window you paired with the desk. Looks great. Thank you rdsparrowriter . I only cleaned it up to take the pictures. LOL. Wow ! You are very creative and neat. Nice tips. Thanks for following me bac2basics and your enthusiastic comment. When you only paint one wall blue, the trick is to put little touches of blue everywhere and it tricks the eye into beleiving the whole room is blue. Use things like blue bottles or paint picture frames blue, blue bedspread, and blue pillow cases, this really does work give it a try. Thank you Dolores.I love that look. Good luck finishing the painting. Very nice. 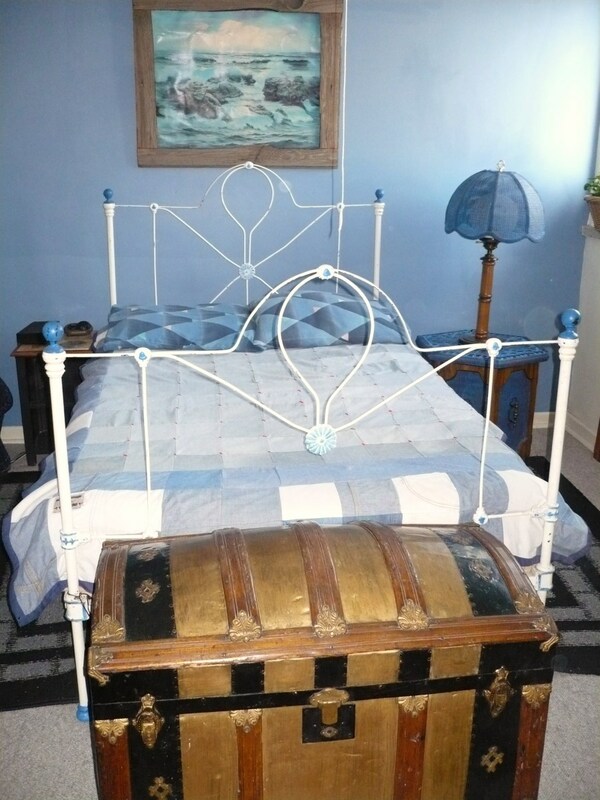 I love the bed and am wanting a metal bed too. My bedroom certainly qualifies for shabby chic, I'm going for the just-inherited-an-old-farmhouse-from-my-great-aunt-and-don't-want-to-fix-it-up look, complete with a paint by numbers picture. 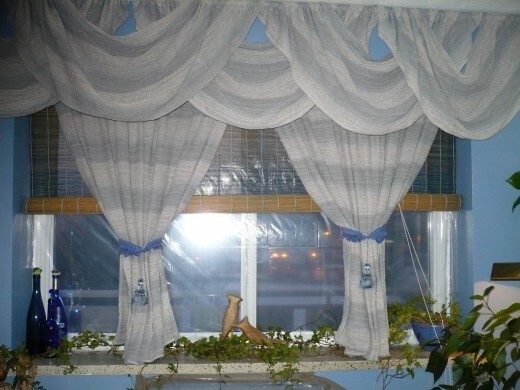 Your curtains look fabulous and what a terrific buy! Thank you very much. I like your idea of the cardboard and cloth too. It is an actual window and I did plan to hang it on the wall above the desk but sort of liked it this way.Thanks for dropping by and commenting. 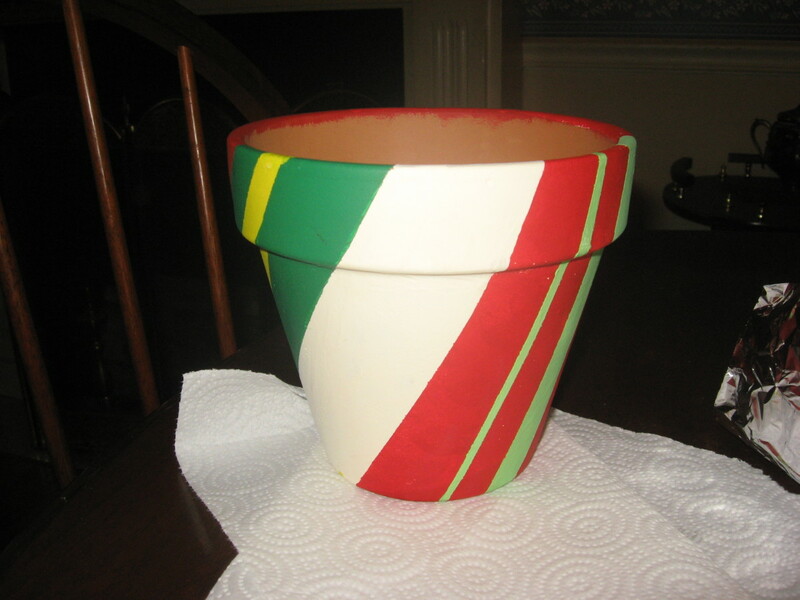 Thank you Dorsi we are a little a like ,my gallon of paint cost 50 cents at a yard sale. I painted every wall with a window in it in my apartment this country blue and when people talk about my place they say it is blue, funny how this trick works. My apartment ,I painted blue walls and I have a real tropical rainforest of plants growing throughout the place because I spent 13 years on and off in Florida and I miss it. Thanks so much for stopping by and leaving this comment. I LOVE what you did with this room - a very pretty blue! I painted one wall of my living room blue from some paint I found for a $1.00 a gallon - but unfortunately it's a little too dark and does not give me the warm look like your blue does. I like everything you did and that nightstand is very cool too! !